Stepping into the space, I was first introduced to the exhibition with (Extra)ordinary, a large 300 cm x 150 cm acrylic and silkscreen paint on found fabric work boldly hung to represent Shih Yun’s position as a contemporary ink artist and abstract expressionist. The layers of acrylic and silkscreen paint, with impressions of Chinese ink left by screen exposure during silkscreen printing, interact with one another to create a work of deep visual appeal and energy. Deeper into the room lie what seemed like captured ephemeral moments during art-making. 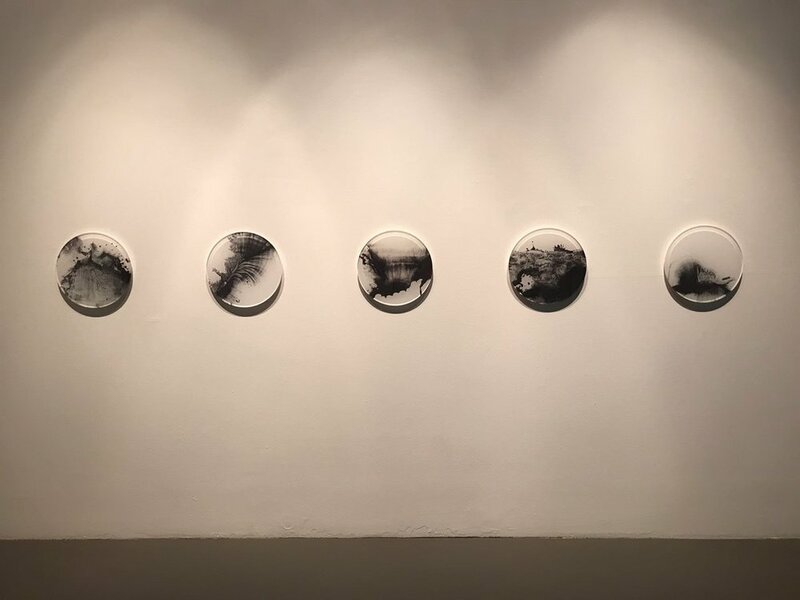 Shih Yun’s exploration with non-conventional media can be seen through her works with UV print on plexiglass and gesso board, experimental films, even paint on 16mm film, though her spontaneous application of ink can still be evident across her works. Robot Painting and Other Tools, which showed a sheet of 1000 cm x 100 cm paper in the midst of being painted by a small robot, was extremely memorable. 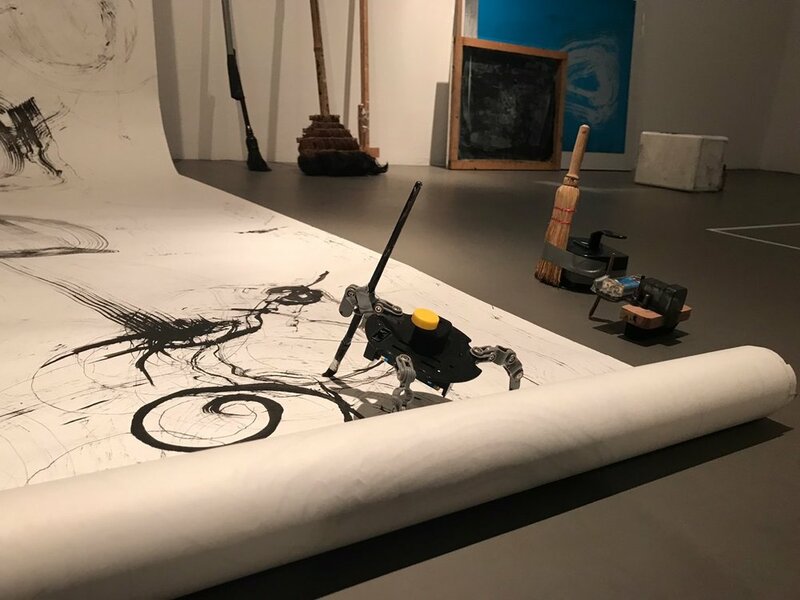 Holding onto multiple tools such as a thin brush and a small broom to apply Chinese ink onto the paper, the robot creates varying textures that result in a playful composition, carefully balancing between the planned and unplanned, inorganic and organic, and control and chaos. 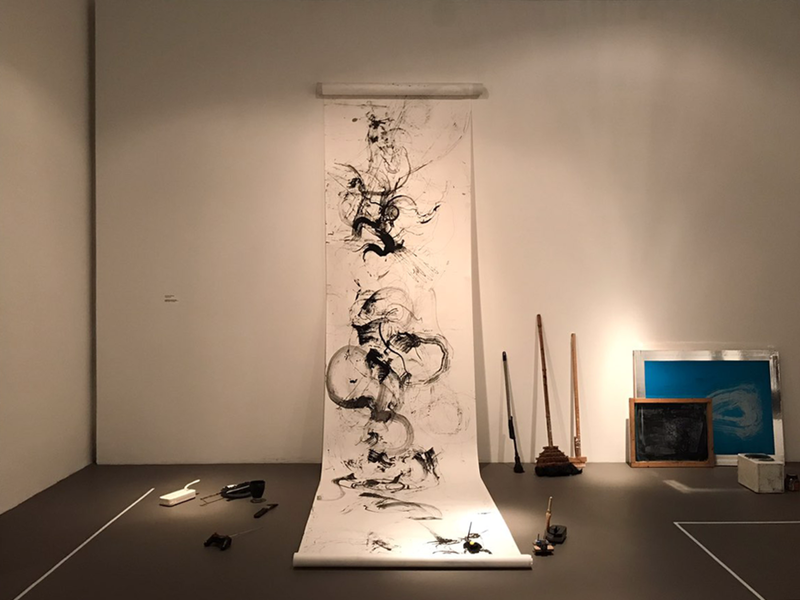 The exhibition showcases the Shih Yun’s enthusiastic willingness to experiment with various media that in her own words, “surrender authorial control, to release drawing from its enslavement to the artist’s hand and in some cases to outsmart (her) own will and intentions.” (Shih Yun Yeo, 2015). Ultimately, however, the interesting application of Chinese ink and its interaction with other paints creates works that remain identifiably the artist’s. More of Shih Yun Yeo’s works can be viewed here. The exhibition runs from 31 August 2018 to 27 April 2019 at NUS Museum, Singapore.